Your smile is your message to the world. Have the smile you’ve always wanted and boost your self-esteem with cosmetic dentistry. Our team uses the latest technology to help you whiten your smile, fill spaces and gaps, repair cracks, and even reshape your teeth. Our experienced staff wants you to have a comfortable and safe experience. If you have any questions or concerns about your smile, share them with us! We would love to create a plan that’s just right for you. Some of our most popular treatments include porcelain veneers, teeth whitening, dental implants, cosmetic bonding, and clear orthodontic aligners. Find out more about these procedures and how they work from the following videos. If you wish to learn more, we would be happy to help. Straighten teeth without braces. 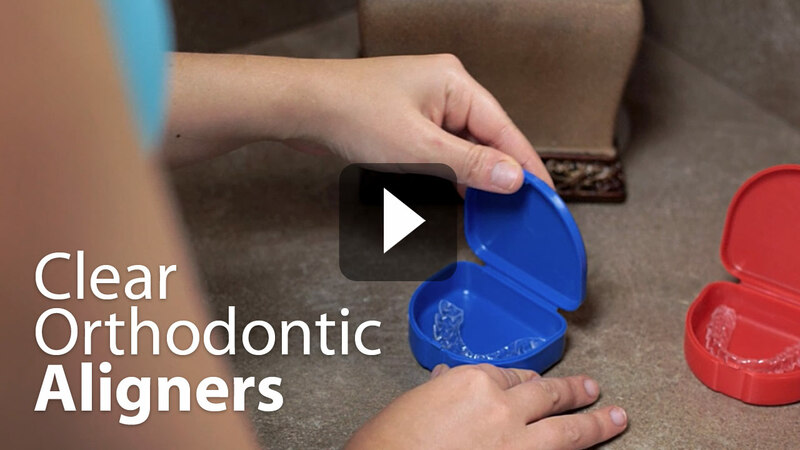 Nearly invisible clear orthodontic aligners are the discreet way to fix crowded, crooked teeth, gaps and spaces, open bites, cross bites and more. Custom-fit trays are made just for you. Gradually straighten your teeth over the course of 6-24 months and feel confident in your smile while doing it. Cosmetic Bonding is a non-invasive and relatively inexpensive way to correct cracked or chipped teeth, remove stains, and repair misshapen teeth or gaps. This procedure affects your natural tooth very little and is often completed in as little as one visit without the need for anaesthesia. Modern cosmetic bonding is incredibly versatile and produces very life-like results. Empty spaces from missing teeth can make you self-conscious about your smile and affect your ability to eat comfortably. Restore your confidence and repair the function of your teeth with dental implants. Supported by decades of research, your implant will be sturdy and indistinguishable from natural teeth. 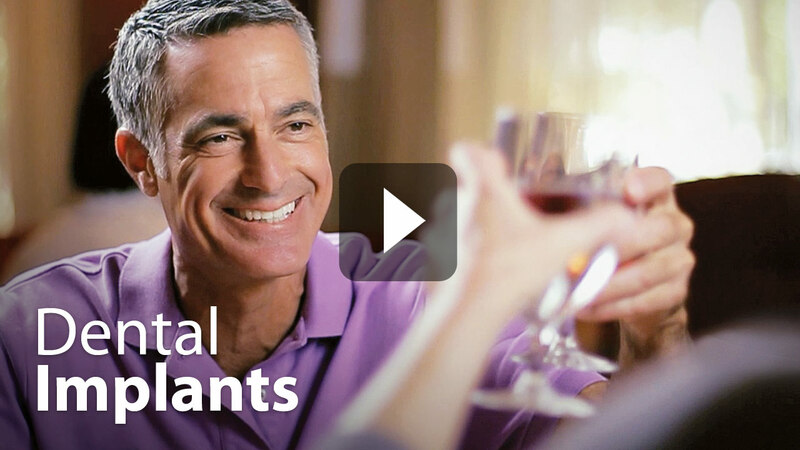 Implants are also used to stabilize dentures for a secure fit. The most popular and cost-effective way to dramatically enhance your smile. Our team will provide precise tooth whitening service custom fit for you. You’ll see stronger and faster results than with any over the counter product. Lighten teeth by 3-8 shades in just one visit and enjoy a whiter, brighter smile for six months to 2 years. Repair crooked, chipped or misshapen teeth and restore a stained or discoloured smile with porcelain veneers. Much less invasive than dental crowns, porcelain veneers bond with your teeth to create a beautiful natural looking smile. The process is virtually painless and can often be completed in as little as two visits. Restore your smile with a dental Crown. Also called a "dental cap", a crown may be the best option to restore your damaged or missing teeth and fortify your bite. Crowns are made in-house, so your custom-made crown will be designed, created and fitted in as little as one appointment. Our expert team will ensure a perfect fit and a beautiful, natural-looking smile. When teeth are damaged & worn down due to one or more of the following reasons a crown is indicated. The crown itself is a cap made of a solid durable material like porcelain, gold or zirconia. This cap is cemented to the tooth to protect it and allow normal function and esthetics. Every material currently present has its own pros & cons, for every situation a material would be different to the others & this is discussed in detail during consultation appointments to make sure that the best material is chosen that would serve function & esthetics for years to come. What is involved in a Crown procedure? The tooth receiving the crown is numbed using the lasting techniques and technology in dental anaesthetic called the “Wand” it allows us to deliver the right amount of anesthetic solution and provide the best outcome to the patient. This guarantees the procedure never hurts. The tooth the is receiving a crown is prepared under extreme magnification to allow the most precise & conservative cutting. Tooth structure is the most valuable material and we make sure we stay extremely conservative. Using the latest technology in scanning and digital impressions (Cerec Omni Cam) , a digital scan of the tooth is acquired & sent to an in-house milling machine that precisely fabricates the crown & allows delivery of that crown in the same visit. In cases where the crown is made of gold the scan is emailed to the lab that manufactures the crown and another appointment is required at that point for delivery of the gold crown. The procedure from start to finish varies between 90 to 120 mins allows for same day dentistry which means no temporary crowns or second appointment..
What is the difference between Crowns & Veneers? Veneers are thin shells of porcelain that usually cover one or two surfaces of the tooth and is usually used in minor tooth fractures or when the shape or color of the tooth needs to be changed. it s a great conservative and durable way to get a long lasting beautiful smile & protect the tooth. When the damage is more significant a crown is indicated as it covers the tooth from all surfaces. Can I bleach my teeth after having Crowns or Veneers? Bleaching agents don't affect crowns, veneers or white fillings, because of this it is always better to bleach teeth to the desired shade before restorative work is performed & this is usually a part of full treatment plan that is carried in steps to provide the best possible outcome. I love treating children and adults but there is something special about working with a child who is too shy or afraid to even look you in the eye. That first smile when they realize they are going to be fine always gives me a wonderful feeling. Everything we do is done with care, kindness and respect for the patient. We are a family clinic in the truest sense. People who come through our doors want the best for their families in exactly the same way our staff want what’s best for theirs.